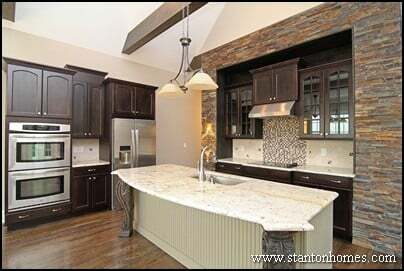 Read on to find out what kitchen trends will hit new homes in 2013. We expect to see more creativity in kitchens, with the addition of a second island. In this version of the Chalet Vert, a second island was added. 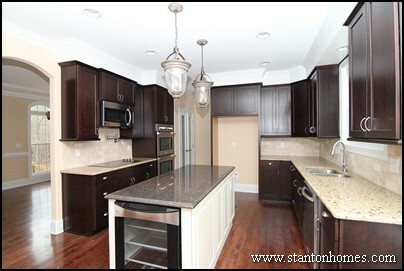 The homeowners wanted to create the feeling of a breakfast room table with the functionality of a kitchen island. With this second island, the kitchen gained another 21 square feet of counter space, two additional large cabinets for storage, and seating for up to five people. 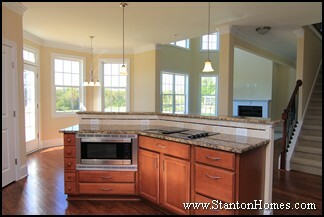 Premium cooking appliances will take center stage in kitchens. Gas cooktops are used by professional chefs, for their instant heat, precision, flexibility, and ease of use. 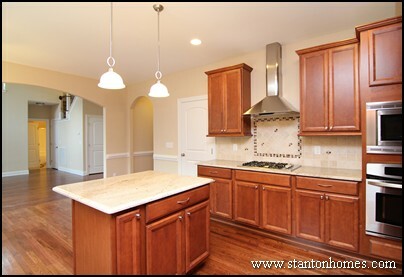 Gas cooktops use an overhead ventilation system, which can also add visual appeal to your kitchen. From glass mosaics to custom inlay designs, kitchens will boast premium tile backsplashes. The kitchen pictured here features a full-height glass mini-mosaic tile pattern above the range coupled with a grey subway tile base used throughout. 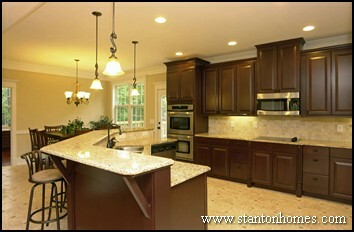 The preference for granite will continue in kitchens. 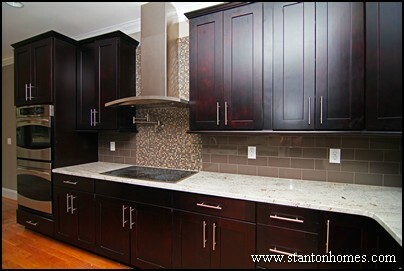 Granite countertops come in a huge variety of colors and patterns - and every counter is unique. 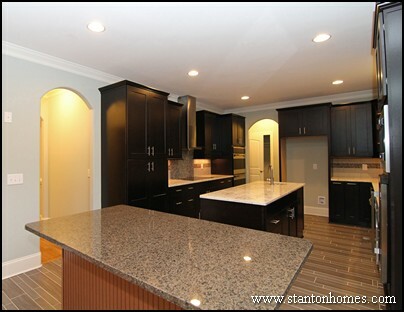 Granite countertops can be chosen to blend into or contrast against tile back splashes and kitchen cabinets. 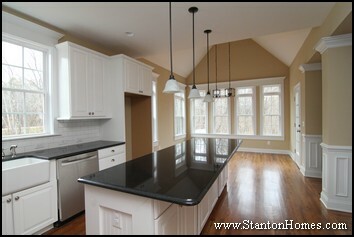 How much do granite counter tops cost? 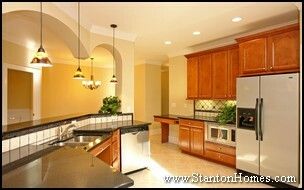 Click here to learn more about adding granite to a kitchen. More and more kitchens are making a statement by combining Espresso/Java cabinet finishes with lighter/white island finishes. 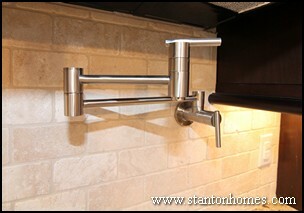 Stone accents - from custom wall surrounds to back splashes and inlays - will make your kitchen look and feel exclusive. 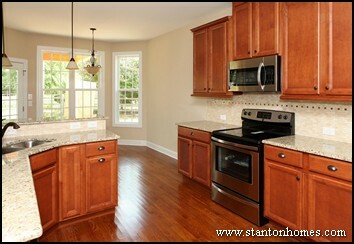 Kitchens will also trend towards including one large walk in pantry or a combination of two smaller pantries. 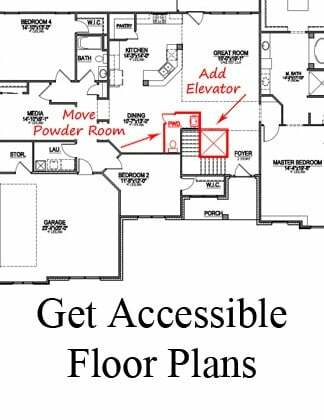 The single large pantry can be tucked into hallways, under staircases, or turned into "hidden" rooms in order to take advantage of previously unused square footage away from the central kitchen area. 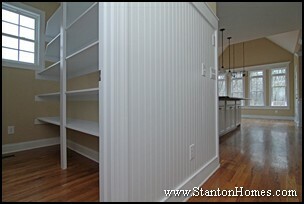 When two pantries are included, one can be added as a cabinet. 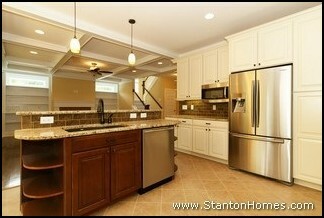 For example, the white cabinetry pantry pictured here was included in a version of the Brogan. Kitchens will also trend towards including a central sink with one larger bowl, rather than two medium bowls (usually a 60-40 ratio). 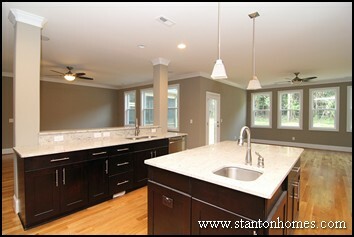 A single, larger sink will accommodate wide baking sheets and tall pots/pans. More kitchens will feature some type of beverage center. Built in beverage centers can be bold centerpieces of the kitchen, or discrete storage areas tucked around the corner in a butler's pantry or hallway. 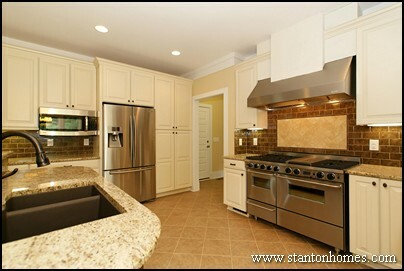 - Professional-grade appliances for those who love to cook. 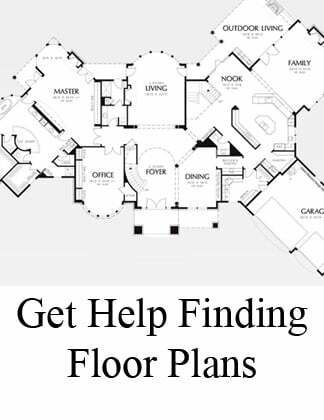 - Floor plan features that meet individual entertainment styles, such as adding a second island, additional sink, or beverage center. 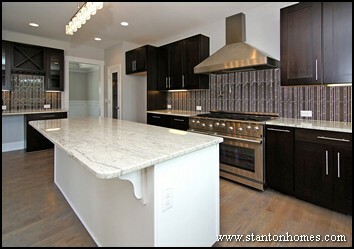 - Upscale designs such as stone accents, custom tile backsplashes, and one-of-a-kind countertops. 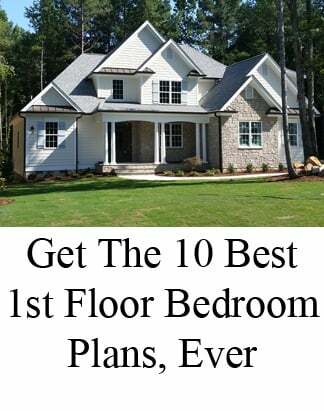 - Square footage maximization with tucked-in pantries/island seating and clutter minimization with inventive storage ideas. 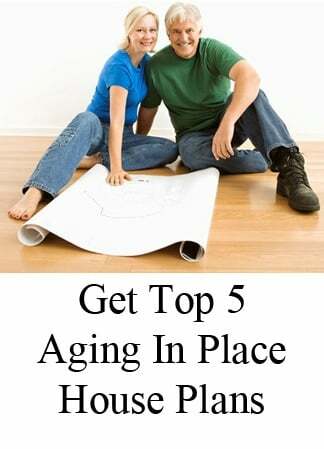 See photos of the top 10 master bath trends - click here.